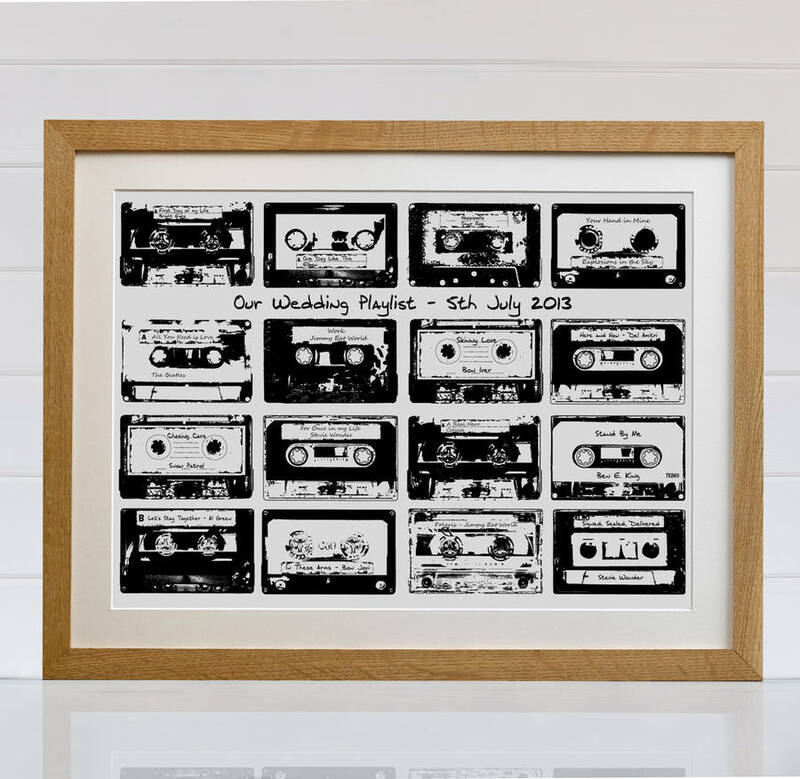 Whether your wedding playlist, the driving mixtape you can't travel without, or theme music to your life, this Personalised Playlist Cassette Print is for you! 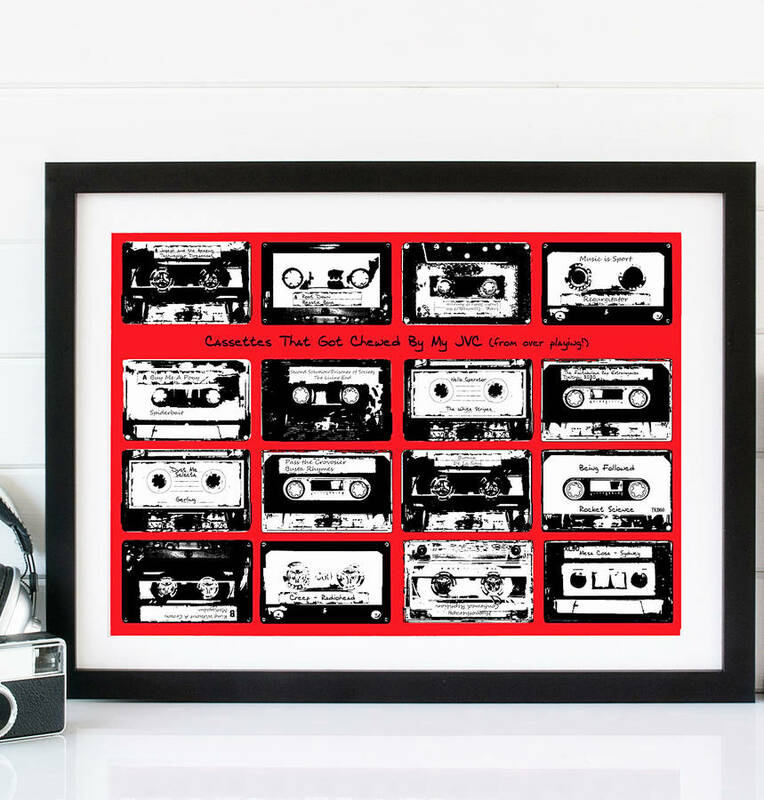 Capture all your special songs on our personalised mix tape cassette print. 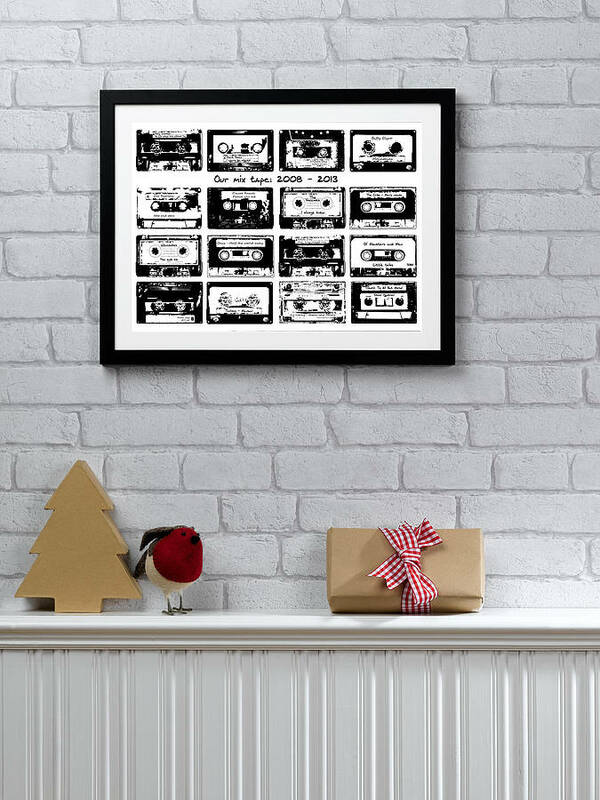 Sizing and framing options are available to suit. 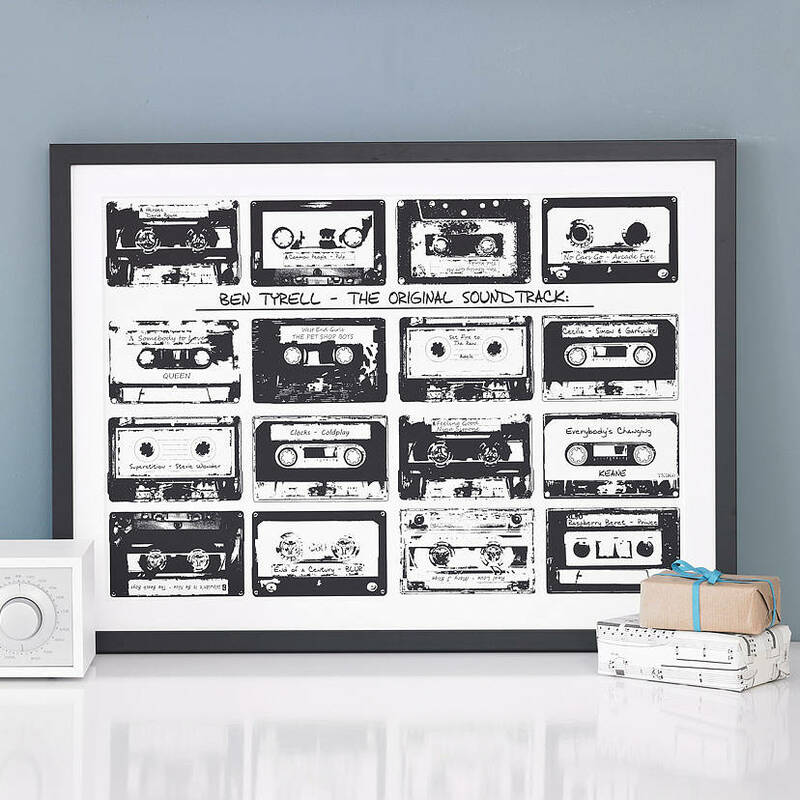 Simply give us your top 16 track or album titles, with or without the artist's name, and we'll personalise the labels of the individual cassettes accordingly in a lovely hand-written font. 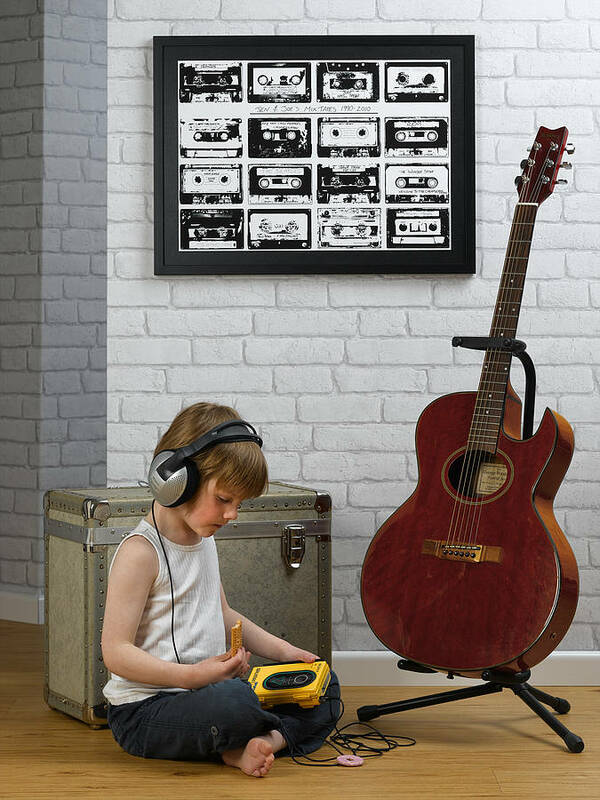 A Giclée print is then created on archival enhanced matte paper. 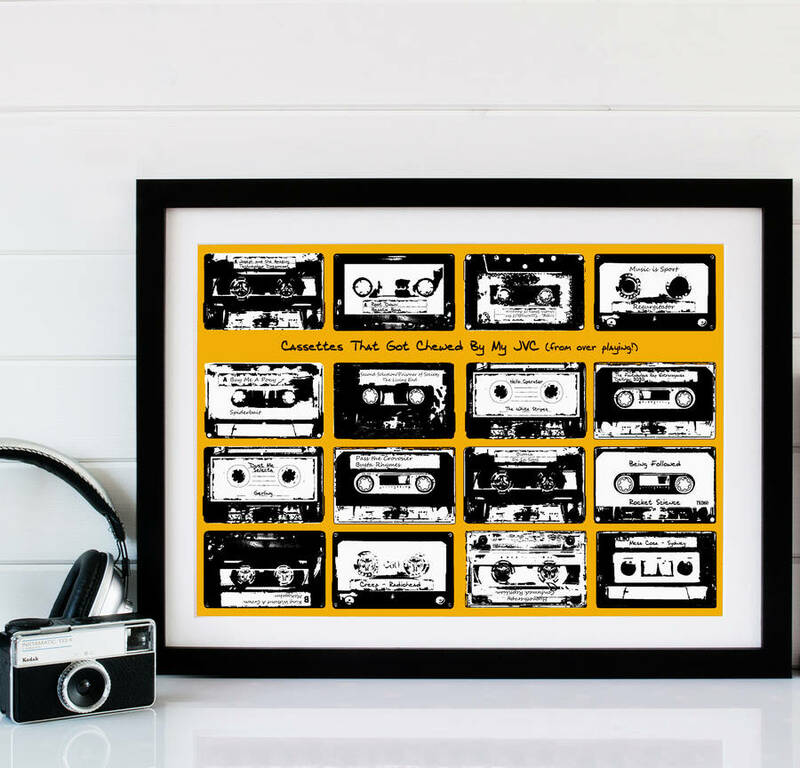 There is also a space for a title, so it could be 'Nic and Dave's Driving Tape' or 'Highlights of Glastonbury 1990' or you could leave it blank and keep folks guessing. 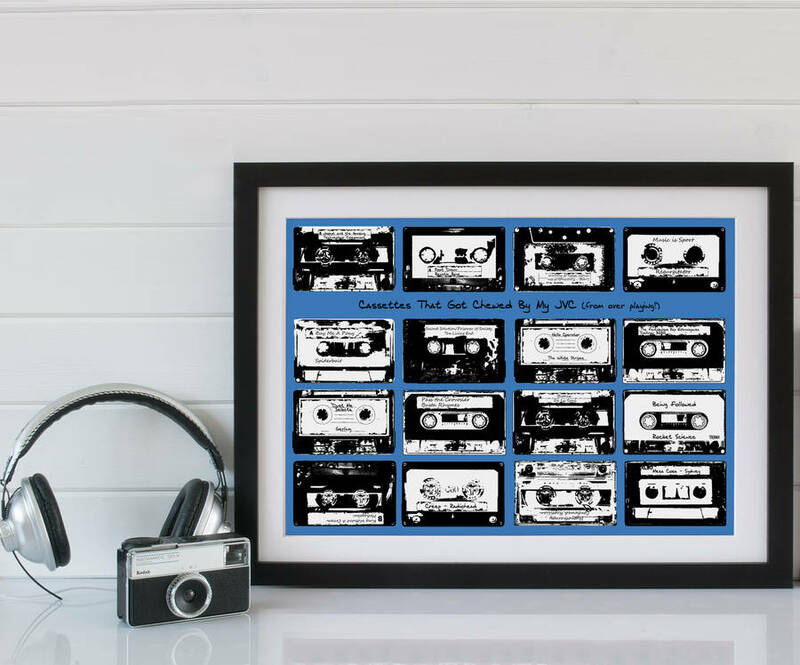 If you don't want a title, we will move the tapes accordingly so there is no gap. 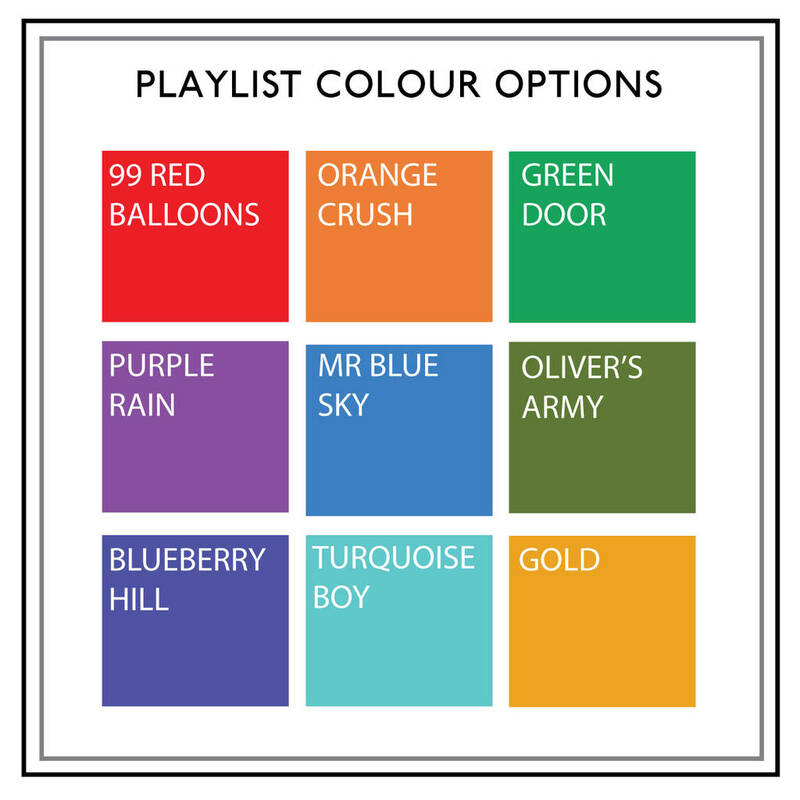 Please take care filling out your personalisations - we will put on your print exactly what you put on your order form. 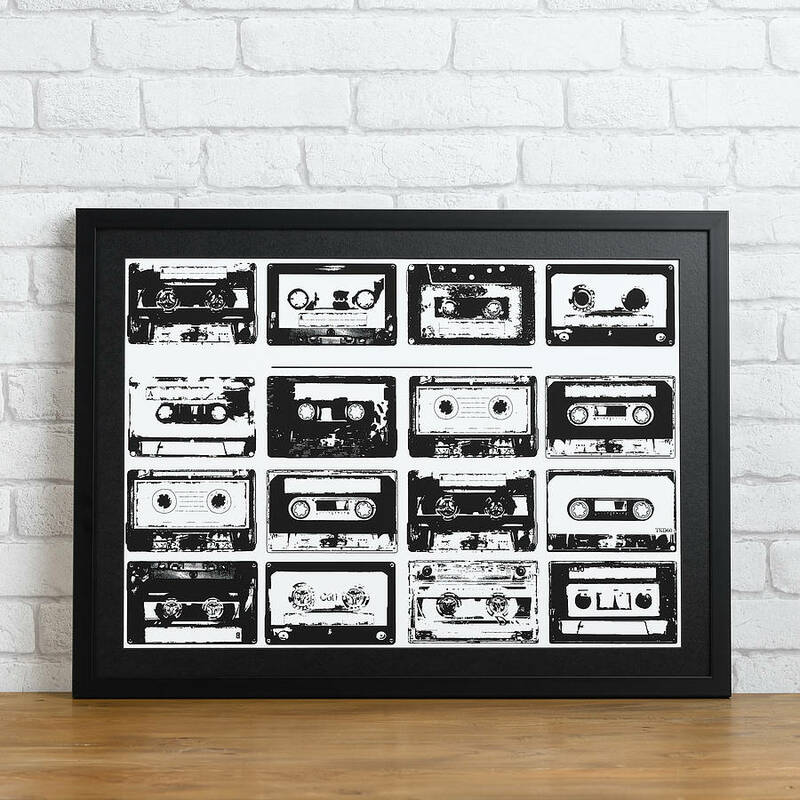 Our personalised playlist cassette prints are individually designed to your requirements and a giclee print is then created using ultrachromatic professional inks on archival enhanced matte paper. The depth of colour achieved is truly delicious and guaranteed not to fade. Our frames are handmade for us in the UK by master craftsmen using FSC approved timber. 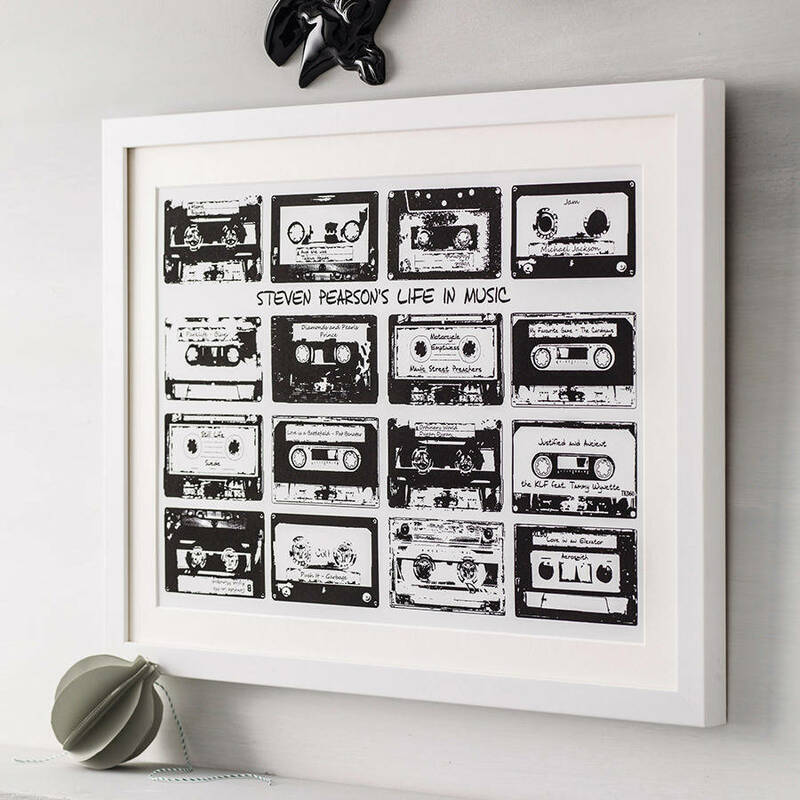 Available in black or white, framed prints are mounted and glazed using high-quality float glass. 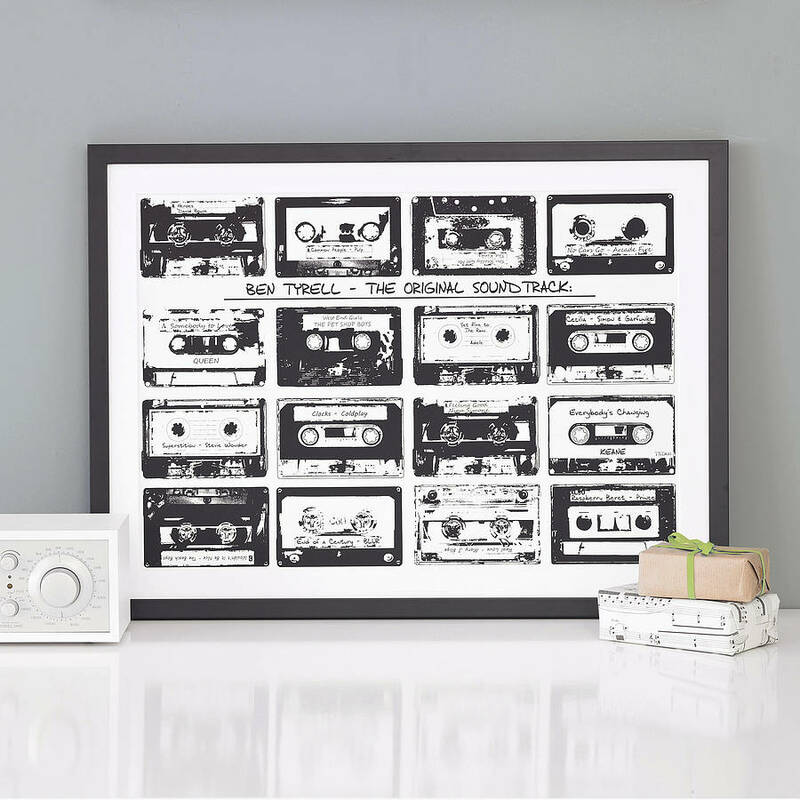 Please be aware, we are unable to send framed prints overseas. 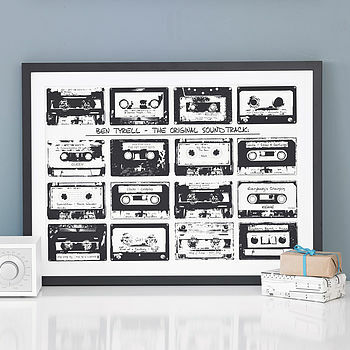 Framed delivery may be possible to non-Mainland UK - please ask for a quote. Need your print in a hurry? 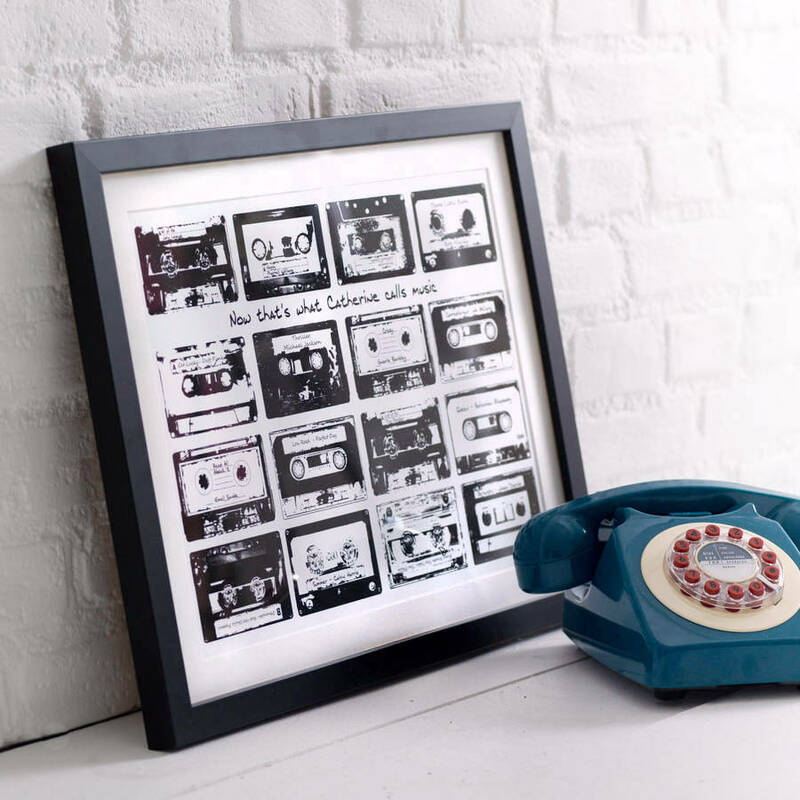 We are pleased to offer the optional upgrade of guaranteed next day delivery for unframed prints. If your order absolutely has to be with you the next day, we strongly recommend this service. We’ll use Royal Mail Special Delivery which will require a signature on delivery. Printed on A3 or A2 paper.